Use this book as a play in your classroom! The Streets are Free by Kurusa is about a group of children in Caracas, Venezuela with no place to play. This book is based on a true story. As the city grew from villages to a large modern city, there were less and less places for the children to play. There was garbage everywhere, the children could no longer play in the fields, forest, or streams. As the city became busier and busier, the children had less and less areas to play after school. The children decide that they need to take a stand and tell the mayor that they need a place to play. The children sought help from their parents but they were too busy working to help. They seek guidance from their librarian who suggest that they go to City Hall to ask for help and for a place to play. They create signs and plans and march to City Hall ready to voice their needs. When they children reach City Hall, they are shut down and threatened that the police will come. Thankfully, their parents come to their rescue, and help them find their voice and speak to the mayor. The mayor and town keep insisting that they will help, but the children have a feeling that their playground and place to play will never be built. A report in the newspaper is written about what these children are doing, and this sparks the interest of the local politicians, so much so that they create a banner and claim a place where this playground is going to built. After a while, the children realize that this playground is not actually going to be built with the assistance of the mayor and City Hall. The children decide to take it upon themselves and work with the neighborhood to finally build this park. The children convinced the neighborhood and their parents that they needed this, and together they were able to accomplish their goal. Element 5 is all about raising awareness for an issue that children feel passionate about. In this story, because of the development of the city, the children lost their places to play. Instead of just sitting back and complaining about how they had no where to play, the children raised awareness and explained this issue to several different people throughout the story. The children raised their opinions and voices to the librarian, news reporter, mayor, City Hall, parents and neighborhood. They shared their voices and opinions of an issue that they felt so passionately about. The children became advocates for this cause of not having a place to play throughout this book and spread awareness of their issue. 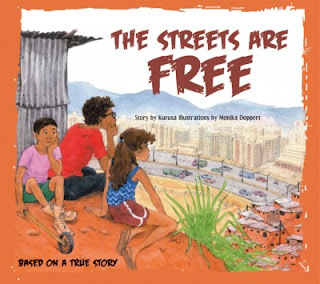 Although this book does translate to change because the playground is built, it is still all about raising awareness and making their concerns about an issue heard. In addition, the children end up building the park for themselves, not having the town take action and make a change. This book can be used in the classroom in a variety of ways. In the classroom, this book can be used about teaching children to raise their voices on a matter that is important to them. This book can be used as a lesson to help children spread awareness and ask for help for a matter that they think needs attention. For example, after reading this book as a class, the class can brainstorm together an issue that they noticed in their classroom or school and begin to spread awareness about it. After deciding on an issue, for example that their school does not recycle, they can begin to spread awareness by making signs to hang up, writing a letter to the principle, or a local newspaper. This book should be used to inspire students to raise awareness about an issue that is important to them in school or in life.